A shorter version of this first appeared in Hampshire View, April 2013. The kiwis have created a category of white wines they call the aromatics. All of them too niche to garner much attention on their own, but together they are gathering a bit of a following. Well maybe soon. Generally the wines are, indeed, aromatic, or semi-aromatic, meaning they are focused on fruits, flowers, freshness and refreshingness, if that’s a word (it is now), and bright, youthful, primary aromas and flavours. This also means most likely an absence of overt spicy, toasty, vanilla oak influence. The types of grape varieties included in the category are riesling, gewürztraminer and pinot gris, plus the even more niche 160 hectares of viognier, the 31 hectares of gruner veltliner and the 13 hectares of albarino (in the entire country). One might even include the 19 hectares of chenin blanc. Of the ‘big three’, at least there are more than 300 hectares of gewürztraminer, 700 of riesling and nearly 2,400 ha of pinot gris. To put all this in perspective, New Zealand has 20,000 hectares of sauvignon blanc. Even so, collectively the aromatics account for no more than 10% of New Zealand’s total vineyard area. No wonder they need to club together. However the region of Nelson stands out as making a play for the aromatics. More than 20% of Nelson’s vineyard area is devoted to these aromatic varieties. 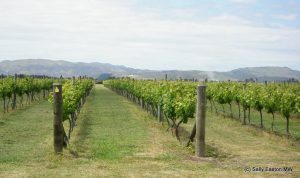 Marlborough has the biggest concentration of plantings of many of these varieties, but they account for only 6% of Marlborough’s vineyard area. Central Otago and Hawke’s Bay also have decent concentration of plantings of these varieties. It makes sense that stylistic differences will emerge from these regions. Viognier probably needs a bit more warmth than parts of the South Island can offer. 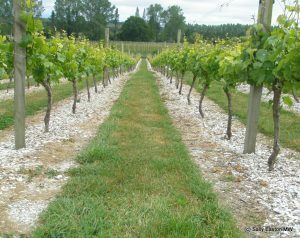 Indeed North Island’s Hawke’s Bay has nearly half of the country’s viognier plantings. On the other hand riesling probably prefers the cooler South Island to better express its aromatics. The evolution of pinot gris will be interesting given that it produces markedly different styles in warmer versus cooler locations – think rich, redolent Alsace versus skin-and-bones northern Italy. Given the recency of attention focused on this group, the trend is to express the primacy and purity and pungency of varietal character, all of which can be beautifully achieved. As well as an absence of oak flavour, generally these are wines for not for bottle ageing. Drink youngish to maximise the intensity of their youthful flavours. The downside of these wines is that rarely is there anything on the label to indicate a level of sweetness. As with a new trend, there’s a huge amount of experimentation going on with these wines, a lot of which involves any of the varieties being made dry, medium dry, medium sweet all the way to fully sweet. Annoyingly this is largely done without communicating this to the consumer. So any time you see ‘dry’ on the label, such as the Felton Road riesling below, rejoice that you have some information and can make an informed purchasing decision. There isn’t even enough consistency or agreement in the industry to say that as a rule of thumb if it doesn’t say dry on the label, then it isn’t. It might be dry. All you can do is ask detailed questions about style before purchasing. Again, given the youth of the trend, plantings of these varieties are not yet showing any regional concentration. It really is a case of individual producers experimenting with a few vines here and there. Matching variety and site is really something that takes decades or even centuries to associate. That Marlborough achieved it with sauvignon blanc almost from the moment the first sauvignon blanc was planted in 1973 is stupendously serendipitous. Learning curves are usually significantly longer. Try any of these knowing they are all dry. Well, the Elephant Hill wine is a blend of 75% viognier, 20% pinot gris and 5% gewürztraminer, it has a tiny bit of balancing sugar and is perceptibly dry, and it’s really tasty (as of course are all the others).